E is for Explore! : SWEET Rock Lab! 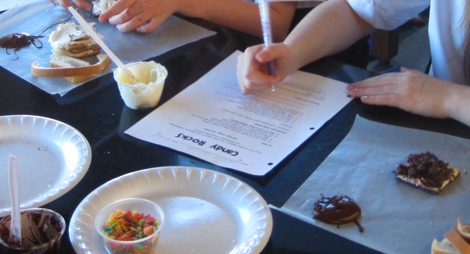 To the Square Inch came up with a geology lab for kids to construct candy models of rocks! Metamorphic: Take wheat and white bread, slice them into quarters. Next, stack them, alternating the bread (wheat, white). Then, press down on the stack. Sedimentary: Spread a layer of frosting on a graham cracker. Then add a thin layer of "sediment" - sprinkles, swedish fish, and fruity pebbles. You repeat the process 2 times. Igneous- Melt chocolate chips, pour on wax paper, and let harden. Visit her site for the recording sheet and other cool science lab ideas! Erin, I LOVE your blog! Your ideas are amazing! Thanks for sharing! Thanks for posting this! This is seriously the most fun lab ever! !